Bet Alexander to win by KO, TKO or DQ at +333 with Bet365. Bet the fight won’t go the distance at +200 with Bet365. The Premier Boxing Champions (PBC) television series has long led the market for compelling welterweight boxing matchups, and two of the more accomplished veterans in the Al Haymon-managed stable of 147-pounders, Andre Berto and Devon Alexander, will finally be facing each other this weekend. Former welterweight titleholders Berto and Alexander meet on Saturday, Aug. 4 at the Nassau Veterans Memorial Coliseum in Uniondale, New York. Berto vs. Alexander will be presented live in the U.S. on Fox and Fox Sports Go starting at 7:30 pm E.T. Most of the top oddsmakers online like Alexander to defeat Berto. Bet365 lists Alexander at -275 and Berto at +200 on the outright win market and other odds compilers are posting similar moneylines. Berto, 34, is a two-time welterweight titleholder who has faced some of the very best 147-pound boxers in the sport over the course of a 14-year professional career. Berto won the vacant WBC title back in 2008 by defeating Miguel Angel Rodriguez by knockout. He defended it five times before being decisioned by Victor Ortiz three years later, but immediately regained world title credentials by stopping Jan Zaveck in 2011 for the IBF strap. In his very next fight the following year, Berto lost that belt against Robert Guerrero. The fighter is 3-3 since 2013, most famously losing by wide margins in what was supposed to be Floyd Mayweather’s farewell to boxing back in 2015. Berto is a scrappy combination puncher who has delivered some of his best performances when he’s not at a talent deficit to his opposition and lures them into fighting his kind of fight. Berto’s kind of fight is rough and fun to watch. He’s not skilled enough as a boxer to win fights from a distance, so his style devolves into him using his above average athleticism to simply outfight people. Alexander was a really good junior welterweight. He won the vacant WBO 140-pound belt in 2009 by stopping Junior Winter, knocked out Juan Jurango for the IBF strap in his next fight, defended the belts once, then lost for the first time in his career against Timothy Bradley 2011. After moving up to 147 pounds in 2012, he’s seen less stellar results. He’s 5-3-1 as a welterweight, but he’s beaten some pretty good fighters in Marcos Maidana, Randall Bailey and Jesus Soto Karass. Losses to Amir Khan and Shawn Porter are nothing to be ashamed about. He had on off night against Aaron Martinez in 2015 but also was reportedly battling an addiction to pain pills and got clean after. Alexander is a fast-handed puncher who carries the stylistic advantage of being a southpaw into most of his fights, something he’ll have against Berto, too. All that means is Alexander’s punches come from different angles than most fighters are used to seeing, while Alexander is almost always facing orthodox fighters in return. While Alexander doesn’t possess fight-altering power, Alexander has fast-enough hands to give most welterweights problems and he’s a crafty, hardworking fighter capable of outpunching his opponents over the course of 12 rounds. Berto has only been in the ring with a southpaw three times in his last 10 fights, losing twice (Guerrero, Ortiz). His last bout against a lefty was two years ago in the Ortiz rematch. Berto knocked Ortiz out in round 4 but had to climb off the canvas two rounds prior himself to do it. 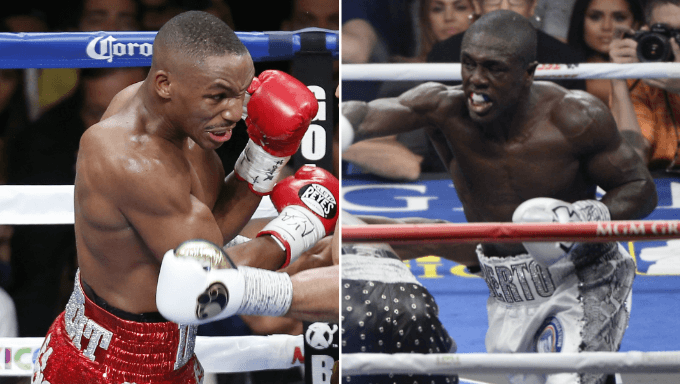 Oritz and Alexander are different kinds of fighters, but Berto seems to struggle with southpaws a little bit, so Alexander will probably be able to use that to his advantage to win the fight outright. Moreover, Berto, 34, is three years older than Alexander, shorter and has a slightly shorter reach. Berto has been in the kinds of slugfests that shorten a fighter’s career, and he’s coming off a 16 month layoff after being knocked out by Porter last year in which he didn’t look very good. Meanwhile, Alexander fought to a draw with Ortiz in February, but most people in boxing think the decision was bunk. Alexander looked like a really solid fighter in that bout and probably deserved the win. The most likely outcome is Alexander by decision, but the only real value you might find for this fight is by betting on the stoppage. While Berto always gives good effort, he seems pretty done as a world-level fighter. Berto is a hard-nosed competitor so he’s more likely to go out on his shield rather than just trying to make it to the end of the fight. Betting Alexander at -275 just doesn’t give much return, so those looking for big returns should have a look at Alexander by KO, TKO or DQ with Bet365 at +333. It’s reasonable to suggest Berto’s shopworn body will be worn down and that Alexander’s fast hands will carry him to a stoppage. Betting the fight won’t go the distance might make some sense, too. Bet365 has +200 there and that protects you if Berto’s power allows him to pull the upset by knockout.